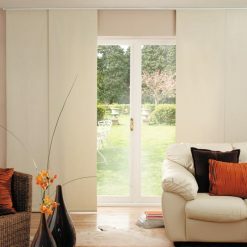 Panel blinds offers the latest in functionality and styling for the most discerning home owner. Both innovative and versatile, panel blinds make an excellent alternative to vertical blinds. Perfect for sliding doors, folding doors and large windows. Panel Blinds can also be used to create decorative panels or room dividers that are both effective and attractive. Our stylish selection of panel widths ranging in size from 450mm to 1200mm; these easy-to-use blinds are available in both – side and centre opening designs to accommodate folding doors as well as sliding doors. Practical and stylish, Panel blinds offer a simple, natural look that is particularly effective in informal areas, transforming your living space or work space. Our suppliers don’t use any steel in the rails, meaning our blinds remain rust-free. Available in most bamboo and roller fabrics, and you’ll find they make a perfectly stylish way of adding light control or privacy to a room. Sheets of fabric housed on a rail system that stack away for complete openness and usability. Panels can be glided left, right, centre or split. Available in stylish fabrics and Bamboo. Excellent alternative to vertical blinds. Panel blinds are available in three to 8 panels depending on the opening width. When closed interlock behind each other to completely obscure the window or patio door. Can be used a feature wall or as room divider. Panels available in 450 to 1200mm panels which include bottom weights. Perfect for sliding/folding door or large windows. Maximum width is 5meters and 3 meter drop. Smaller panels are ideal for stacking but additional panel increase costs. Stacking of panels either on left, right or centre needs to be decided prior to ordering as manufactured accordingly. Stacking and controller can be ordered on opposite sides. Includes one year manufacturer guarantee, plugs, screws and installation instructions.